This is a fairly simple procedure. I would recommend you allocate a whole day to this procedure so you don't rush things and let the paint dry between the different steps. By no means am I a professional paint/body person. I am sure there are many different ways to prep this project. 1. 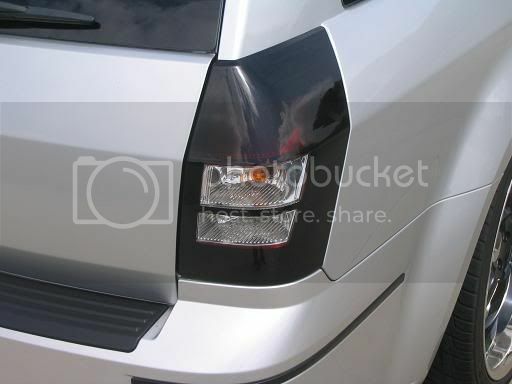 Remove the 2 panel clips on the side of the taillight. You can use a flathead screwdriver if you don't have a panel popper. 2. Remove the plastic screen on the interior. Pull back the insulation and you will see the plastic wingnut that is holding the taillight on. This is were a pair of small hands helps. BE CAREFUL NOT TO DROP THE WINGNUT INSIDE THE PANEL. You will not be able to retrieve it. 3. Pull the taillight out and remove the bulbs/wiring. Repeat on other taillight. 4. Now that we have the taillights out, we need to prep them for the paint. I used 1500 grit and soaked the paper in water. I sanded each taillight making sure to keep the sandpaper/taillight wet. 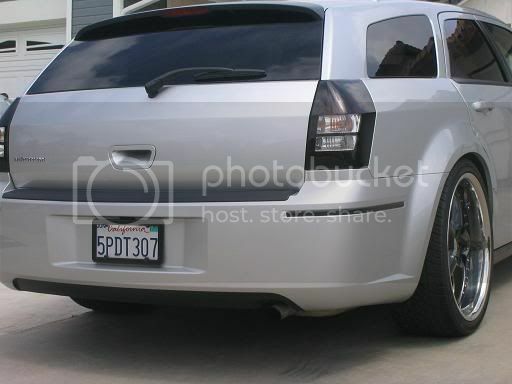 After you have sanded the taillight, mask off any areas you do not want tinted. For this set, I choose to leave the reverse lights clear. 5. Spray a light even coat onto each taillight. Wait about 20 minutes(depending on temp) and do additional coats until the taillights are to your desired darkness. I choose to do 3 coats as I wanted it dark, but still wanted to be able to see the brake lights during the day. 6. You may choose to wet sand in between each coat. If you do this you want to leave more time to let the paint completly dry. Next, apply your clear coat to protect your taillights and give them a glossy finish. Unfortunatly, by this point I got very impatient and put on a couple HEAVY coats of clear too quickly. This resulted in some huge runs. I have ordered a buffer and will show you how to wet sand and buff your taillights if you run into the same problem. Here is a finished picture of the taillights installed. Last edited by Chutsk10; 04-27-2012 at 11:47 AM. Reason: Rename title. wow, thats a nice look! I'll be trying it out this weekend, hope they look as good as Steve's..
Borla Exhaust Hidden Content , Superchips Hyperpaq Hidden Content , K&N Cold air intake Hidden Content , Pioneer AVH-P6800DVD 6 DVD Changer Hidden Content , Kicker 12" L5 Solo-Baric Subwoofer & Enclosure Hidden Content , ROCKFORD FOSGATE Amplifier T5001bd Hidden Content . 20% Tints. 22" KMC Jacks & Five Hidden Content . Clifford G5 Alarm Hidden Content . Just saw your how-to on the tinted tail lights. LOVE THEM!!!! I'm going to try this this summer. A quick question??? Will this same process work on the head lights??? Don't know if you have tried it out yet. Hey steve are there any local automotive stores that sell VHT Nightshade. I tried pepboys autozone and kragen. I am thinking im going to need to get it off ebay so i dont have to pay the 10$ shipping charge from Summit. Where did you get yours? Im not sure about painting of the from lightrs, but i would assume it would be simmilar. But if you do a search on headlight tint in this forum there is a topic that show syou how to take apart the headlamps to do the tint on the inside of the light. I got mine from here. It was a bit cheaper than summit, but I'm also impatient, so I put a rush shipping, 3 days for $12. But then again I also ordered 3 cans, cause I have a feeling that a few friends are going to want the same treatment as soon as they see mine. Should be the same process for the headlights. I don't know what the light output would be like. I was unable to find any at the local automotive stores. I got mine on ebay and since it is an aerosol, the vendor has to ship it via ground. You may try a paint and body supply store. They may have a similar product. Also don't forget to put a clear coat on. If you don't put a clear coat on the finish is rather dull and can be easily scratched off. again thank you for the write up Steve! Very very nice BigAl!!! 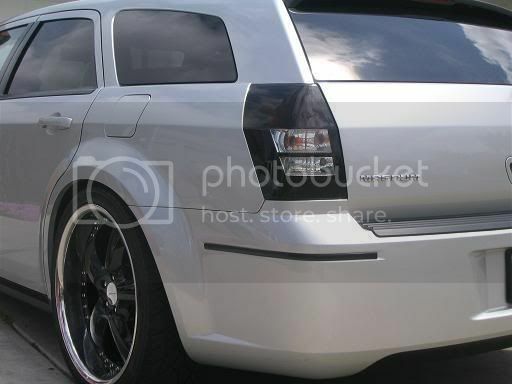 I thought about doing that with mine, but Im not doing the black silver look. Not sure if it will look good if I did. SoCalLX - " Where Southern California Car Culture Meets Modern Mopar Muscle"
Did the tint yesterday. It all went very well. I had one issue though. After I put three light coats of clear coat on the tail lights, they still looked cloudy. I wet sanded them and polished them when I was done. I'll have to take them off when I get another day off and clear coat them. Overall it is a simple, but time consuming mod. Very happy that you put the directions up and you were so detailed in your description.